It seems like the Hoverfly-season is almost over now, but if you see a hoverfly hovering about (as hoverflies tend to do), I’ve been told that you can place your hand underneath it, and it will land on your hand. But not only that, you should actually be able to “caress” the fly, without it taking off. This entry was posted in BaseWord on 28 August, 2005 by Erik. “Sic” is Latin for “thus.” Yeah, that didn’t clear it up for us either. But apparently, since the 1880s, writers have used [sic] next to quotations that include errors. This little notation means, “Hey, I know this quote looks wrong, but it was that way when I found it, so don’t blame me.” Maybe the original text used archaic spelling or the original writer just messed up. But the person who’s quoting that text is aware of the earlier mistake and wants you to know it. [Sic] is shorthand for all that, at least to scholarly types. Btw. To my knowledge, all the quotes on this site are correct! But bear in mind that a lot of the quotes were originally written in another language, so details might have got lost in translation. This entry was posted in BaseWord on 24 August, 2005 by Erik. I’ve now reached a total of 500 quotes in my collection, by which you can see three (at a time) at this site. To celebrate that event, I want you to do at least one thing today, you enjoy doing. (I’ll go outside, where the sun is shining, and enjoy a nice cold beer). This entry was posted in BaseWord on 18 August, 2005 by Erik. 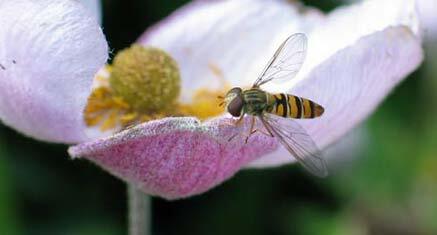 Picture of an Episyrphus balteatus (Marmalade Hoverfly) taken today. (I don’t know much about insects, but I found the name on Google 😉 Btw: in Danish it’s called a “svirreflue” – and it’s harmless. Despite the colours, it doesn’t sting). This entry was posted in BaseWord, PhotoBase on 15 August, 2005 by Erik. These days it’s 17 years ago, I bought my first Compact Disc player, a Kenwood DP-660SG. The CD format was still very young, but there was no doubt, it was a winner (and so it was). Now, 17 years later, I still have that CD player! It still works like a charm, so I haven’t had a reason to replace it. That’s quite something, I guess – but what’s more impressive: I never even had to replace the batteries in the remote control! Yes – the batteries in my remote control are now 17 years old – and they are still functioning! That’s amazing. This entry was posted in BaseWord on 14 August, 2005 by Erik. This entry was posted in BaseWord on 13 August, 2005 by Erik. The other day I bought a very small portable DVD-player (no-name, made in China, menus in French – yes, it was cheap). The main reason – besides my love for small electronic devices – is that I’m about to take a small trip to the other end of the country. While staying there, I might get bored, and therefore feel the need to watch a film on my new 7″ screen. Thinking about it, it’s actually a bit funny. I plan to get bored (trying to get rid of stress, I almost hope to get bored) – and then I buy something to reduce that boredom. This entry was posted in BaseWord on 3 August, 2005 by Erik.